What is Binge Eating and How do I know if I am Binge Eating? Many people struggle with binge eating and it’s becoming more and more common in today’s society. The stories are different but the feeling is the same: “I feel out of control when it comes to eating”. As a dietitian with over 10 years of experience in the eating disorder field, I can tell you for certain that everyone has a different story and reasons for binge eating. One of the biggest ah-ha moments that people get in nutrition counseling is that binge eating is subjective—there is no “set amount” of food that you have to eat to have a binge. But OF COURSE we can’t create a diagnosis without “set criteria” can we? So take this as it is, but there is an official diagnosis of binge eating disorder that may feel helpful to read. — Eating, in a discrete period of time (e.g., within any 2-hour period), an amount of food that is definitely larger than what most people would eat in a similar period of time under similar circumstances. — A sense of lack of control over eating during the episode (e.g., a feeling that one cannot stop eating or control what or how much one is eating). — Eating alone because of feeling embarrassed by how much one is eating. — Feeling disgusted with oneself, depressed, or very guilty afterward. 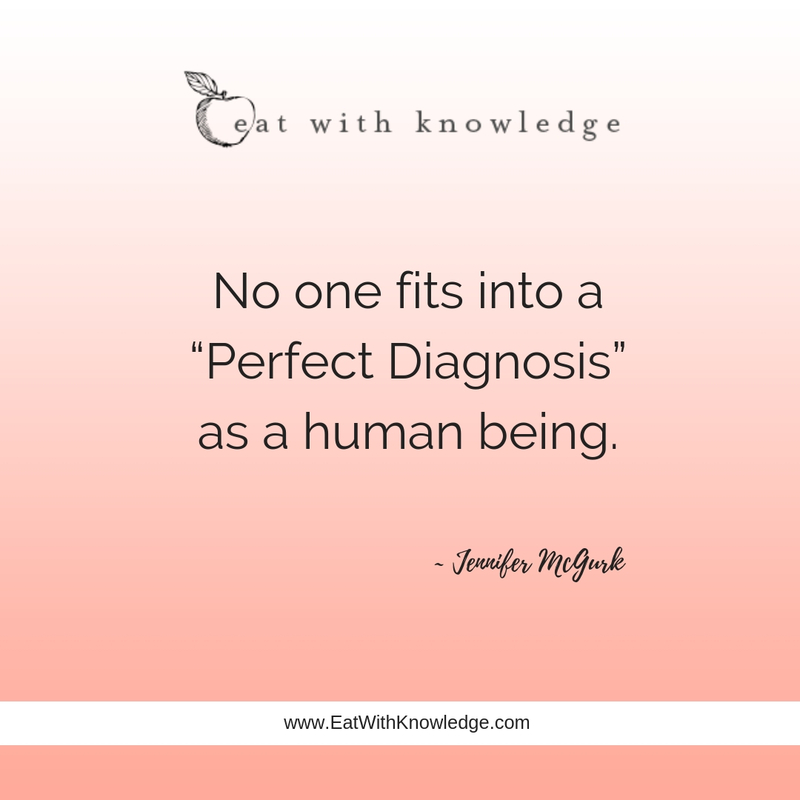 Trust me, no one fits into a “perfect diagnosis” as a human being. But I do think this can be helpful to read because it differentiates the difference between binge eating and overeating. Overeating is eating too much at a birthday party or a dinner out with friends You know the food tastes so good but you still do it anyway. Overeating doesn’t come with the shame that binge eating comes with. Binge eating is associated with the feeling of shame and wishing you could do something different but you don’t know how. You don’t feel good about the binge after the binge or you know having binges don’t allow you to reach your own goals. Maybe that’s being more mindful or decreasing eating from the large packages. It’s usually about behaviors around food and not the food itself, although of course you blame the food! A teenager that wants to be healthy, so they have carrots first, then an apple, then moves to a banana, then fruit salad, eating so much “healthy” food they feel sick but still want more. A person who gets up in the middle of the night to eat and can’t fall back to sleep until they have eaten a certain amount. Even though these situations are different they all have something in common. They are disconnected from their bodies and/or their emotions. They might binge because they are too hungry or on a diet, but also because they are all in emotionally charged situations and have developed bingeing as a way to cope. But guess what? It doesn’t there to be like this. I have years of experience helping clients move away from the binge eating cycle and into a healthy relationship with food. It would be an honor to help you too. 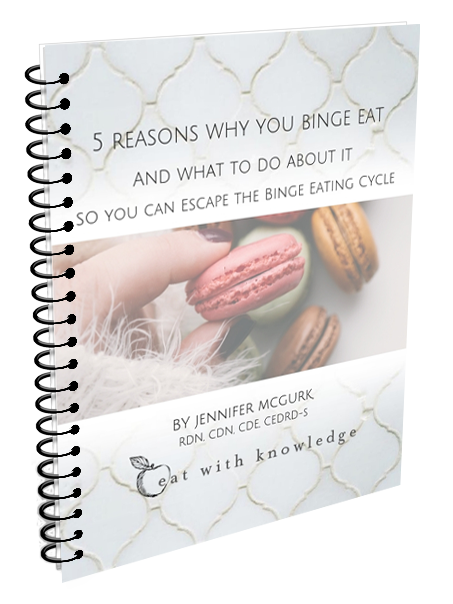 You can start by downloading my free guide that will give you 5 Common Reasons why we Binge Eat and what to do about it so you start to escape the binge eating cycle.